OK, well it has nearly killed me keeping this a secret, and well I didn't from everyone. BUT now I am at a stage that I am comfortable sharing with everyone. On Monday we had an ultrasound to see our second bub to be. YEP Baby Beattie No. 2 is on the way. I always wanted kids close in age, and I am so pleased because there will be only 19months between them. 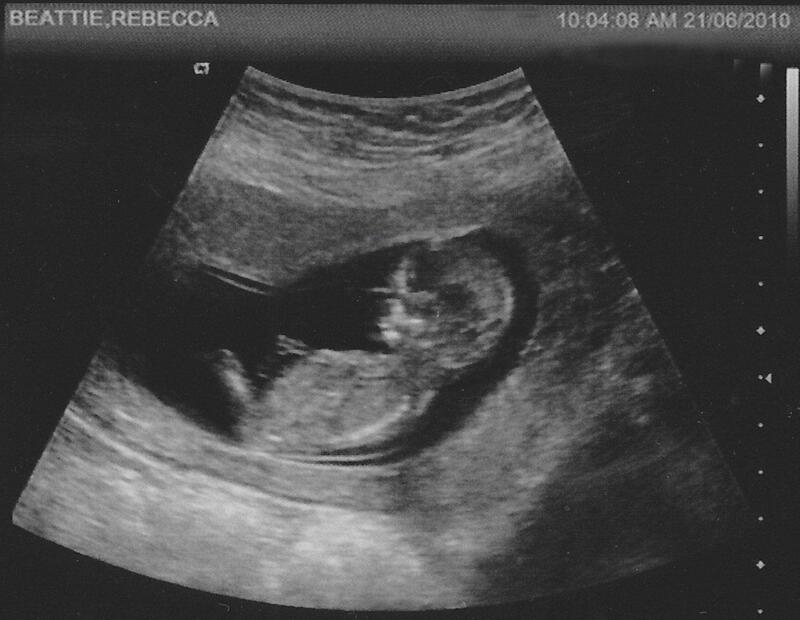 It has been a very different pregnancy so far so I was looking forward to the scan, just to know all is OK, and well it was awesome to see our little jellybean up on the screen and here is a pic from the scan. Up until last week had been very tired and felt like I had been hit by a bus. I also had a bad cough as the start of the pregnancy where I cracked a rib and although I couldn't get it confirmed (couldn't get an x-ray because of the possibility of being pregnant) it didn't heal for 8 weeks! So all this combined has meant a huge lack of scrapping being done. I just haven't had the energy to even think about doing much scrapbooking. Just really wanted to crash on the couch whenever I could get a chance. I have gotten back into the scrapping over the last couple of weeks, but unfortunately it is not work I am allowed to share at this stage :( I will share them as soon as I can. I am off on a retreat this weekend so hoping to get some things done so that I can share them next week. So stay tuned. Hope you are having a week as good as mine has been. Oh I am so excited for you all. Sorry to hear that things haven't been so great but I hope things will start to improve. Again what fantastic news. So glad to hear you're feeling well again. It's hard to be excited when you're tired - hope you can enjoy the pregnancy from now on. Have a wonderful time at the retreat! Oh my what a gorgeous picture a huge congradulations on Baby Beattie No 2 this is wonderful news. hope you feel better soon ewwww I can so relate to the yuckkky pregnancy feeling.